Buying and selling a home can be a strange combination of very personal feelings and very impersonal relations. Both the buyer and the seller usually have strong emotional connections to the house, but in the course of making the sale, the two parties don’t always meet in person. If you don’t get an opportunity to met the current owners before you buy, there are important questions you need answers to that you should ask the selling agent. That being said, an unexpected visit from a former owner can give you the chance to ask lingering questions and learn more about the house from before it was yours. How recently were the plumbing and other systems updated? Were there any problems during the updates? Are there other issues with the neighborhood, area, or the home? Sometimes you don’t get an opportunity to met the sellers before the transaction is complete, but come face to face with their seller some time later when the seller chooses to return to their old home. How receptive were the neighbors to renovations and updates to the home? Do they have any favorite contractors they can suggest? Do they have any thoughts for upgrades that they were considering before they sold. They may have ideas and thoughts about improving the home that hadn’t occurred to you? Do they have any stories about the home’s history? Of course, the former owner may wish to ask you questions too. Many sellers often still feel a personal connection to the house and want to share that with you. 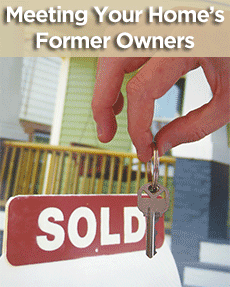 It isn’t uncommon for former owners return for sentimental reasons. They may have had children grow up in the home, or it might have been their first major purchase. Ultimately, they often just want to make sure you’re caring for their former residence. They even may ask you questions about your family, or how you plan to change the house to fit your tastes. In any case, meeting your home’s former owners is a chance to learn more about your home and learn about your home’s history.